Warning: This post contains spoilers for Lost Odyssey, The Darkness, Final Fantasy X, Passage and Uncharted 2. This past weekend, my Experience Points writing partner Scott Juster got betrothed. The wedding ceremony was excellent and it felt rewarding to watch to great friends, clearly in love, become betrothed. For centuries artists have developed pictures of love, the all-consuming emotion that is so fundamental to human life and culture. To capture the medley of sensations included in love is a grand endeavor, for whatever creators come up with will only capture a shred of what weddings are designed to celebrate. With such emotions in the air, what better time to explore romance in videogames. Conveying the feeling of love to someone, or something, not actually real is tremendously difficult - in no small part because love seems to encompass the gamut of human feelings. Longing, worry, jubilation and jealousy can all stem from romance. Artists draw upon a suite of sensations when depicting love. The best game designers and writers capture some of the elements with careful precision. Interestingly, the only undoubtedly married couple playable in a videogame that I could find is Kaim and Sara of Lost Odyssey. 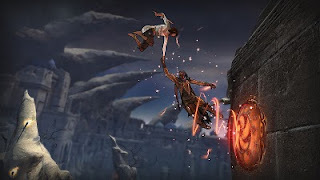 While a portion of the game includes Kaim’s search and rescue of his beloved, their emotional connection is enhanced by their partnership in action as well. Knowing they are romantic partners enhances the meaning of companionship in the game as we rely on her skills in combat in addition to her presence in the story. The shared experience between two playable characters makes the game’s happy ending that much more rewarding. Unlike the tragic consequences of romance between Cloud and Aeris, the game confirms the love between two characters and even celebrates the concept with another scene of a marriage. The physical presence of another, the back and forth between mere accompaniment and reliance, is an excellent method of communicating a meaningful relationship. 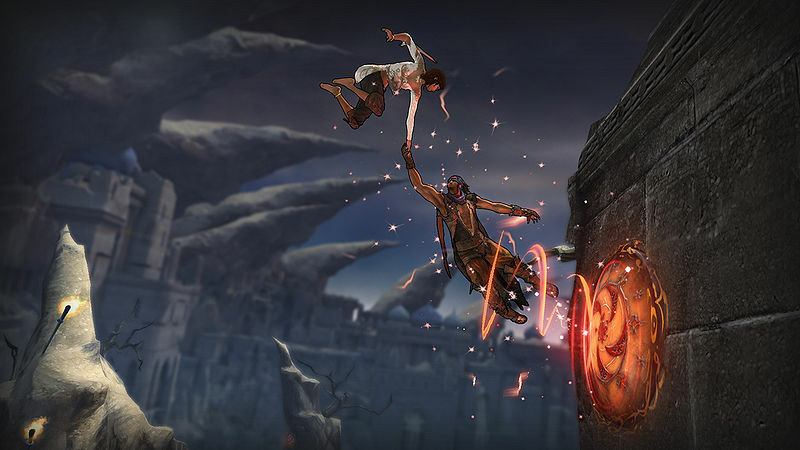 The haptic communication of Prince of Persia, and the Prince’s reliance on Elika, creates a non-spoken bond between the two characters. The way their banters changes over time, becoming increasingly friendly, emphasizes their growing relationship. The absence of Elika during a few brief moments in the game, particularly considering how useful she is mechanically, evokes a sense of loss and concern, some of the emotional risks that come with love. While others surely disagree, I found the Prince’s decision at the end of the game to revive Elika despite the consequences to be both believable and moving. Even the strongest willed individuals have made tragic mistakes because of love. 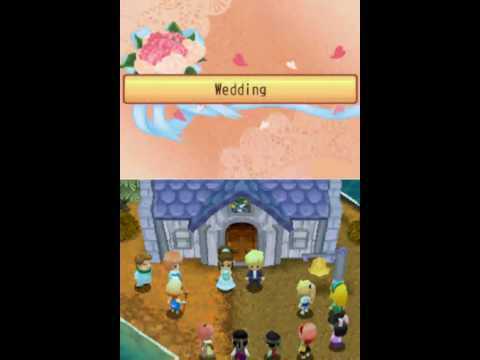 The Harvest Moon franchise lets players woo a love interest and even marry and have children. Like marriage in Fable II, the game breaks down an evolving relationship mechanically, essentially creating a “Will you marry me?” flow chart of optimal decisions. Once married, the familial character is more of a household adornment than a realistic love interest, but it does create a feeling of reassurance. One aspect of romantic love is knowing another person will be there for you, by physically and emotionally. The spouses of Harvest Moon and Fable II capture this slice of comfortable romance just slightly. 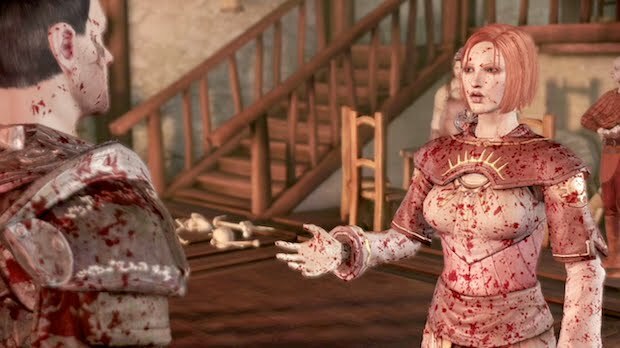 Dragon Age: Origins does a better job of conveying the growth of mutual affection. Seducing Leliana, for example, requires numerous conversations and “correct” dialogue decisions. These story elements develop a friendship between two strangers in a relatively organic fashion. While the game does still measure and monitor relationships, which devalues any budding romances, it makes up for it with dialogue. If, after sleeping with an NPC, the player character has a romp with another party member, their first love might even confront them. Dragon Age depicts the friendship aspects of romantic love, a just a little bit of jealousy as well. The story of loss and pursuit are common trends for videogame romances. Mario must love the Princess, right? Why else would he risk his life, time and again, traveling through the mushroom kingdom and into the heart of Bowser’s castle if not for love? Sadly we know nothing of their relationship. It is just as feasible that Mario rescues Princess Peach because he has a strong sense of patriotic duty to his future Queen. 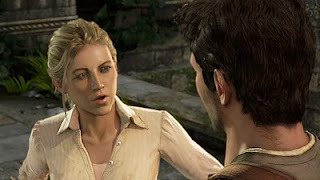 Similar tribulations face Drake when Elena’s life is threatened in Uncharted 2. Likewise, Jackie from The Darkness is faced with the disappearance and eventual murder of his girlfriend Jenny. So distraught is Jackie that he tries to commit suicide. Love is also capable of conjuring up powerfully dark emotions. Tidus’s death in Final Fantasy X is moving, and Yuna’s attempt to whistle for his reappearance is heartbreaking for anyone who has felt the cold sting of love’s absence. Yuna’s pursuit of Tidus is even strong enough to fuel the story of Final Fantast X-2. The prospect of reviving her lost love, like the option that faces the Prince, is too appealing to pass up, even if it means untold dangers. Such adventures are common in games, perhaps because of the excitement such tales as The Odyssey has inspired in those willing to risk everything for the ones they love. Jason Rhorer’s Passage captures the feeling of accompaniment and emotional loss present in Prince of Persia in an austere package. In one moment of profundity, Rhorer’s evokes a powerful sense of loss when your companion dies and your solitary character must carry on alone. He also evokes a similar sensation when the helpful partner in Gravity goes missing, trapping the player character on the bottom level, alone but for a slowly dying fireplace. Love does not come without risks. Artists and designers capture shreds of love, even some of the melancholy ones. Love is hard to find and is invaluable. Depicting the complex range of emotions associated with love is an impossibly hard task. To embark on such an endeavor, to resolve oneself to depict and evoke sensations of romance, is a noble act. Even in these videogame fantasies, we are reminded of love’s fragility, its warmth, its comforting aura, its excitement and its dangers. To some extent, even artificial amor reminds us to cherish what love we find in our lives. In the spirit of adoration and fascination with love, let this article be a toast - to Scott and Hanah on finding, capturing, and appreciating the most powerful sensation of all. Also, Scott will probably be embarrassed that I'm sharing this, but here goes: The week after we got engaged, Scott and I were playing Little Big Planet and we put the bride and groom outfits on our Sackboys. Even though they are silly costumes in a light-hearted game, there was something kind of special about it - we were taking on new roles on and off the screen. It almost feels like a cheap way to tug at your heartstrings. One of the strange things about being in love is when you feel like the only person who has ever experienced those feelings, even though almost everyone on earth has been in love at one time or another. When a game portrays love, however simply, it gives the game instant access to our guts. Jorge, you ol' softy you. . .
Glad I'm not the only one who really liked the Prince of Persia Reimagining. The ending was spectacular. It's a shame that they went back to the other story so they could ride the coattails of a terrible movie. Love is definitely a tricky thing to get right in videogames. I really like what you said about how love is utilized in PoP. Like life, the love in that game relies heavily on dependence. In the case of a game, the dependence is a gameplay mechanic. In the case of life, our dependence is a psychological one. The parallel really sells the game's relationship story. Ico is able to do something very similar (and, in my humble opinion, better) with Yorda and Ico. On the less happy, more nuanced, side of love, I really enjoy the silent hill series. In particular, SH2 and Shattered Memories. Two very different and layered kinds of love. If you haven't already played them, I highly recommend them. P.S. Congrats Scott an' Hanah. The couple that games together stays together. Really enjoyed this article. Especially the mention of prince of persia. I did end up having a connection with the character in a sense that I was actual bewildered when she was not at my side. Although she still did a good job of annoying me while she was there, helping her up sides when she can clearly fly where ever she wants. That story is way too cute. I'm glad you pointed out how quickly we are to be pleased by depictions of romance and affection. Portraying love can be a cheap way to stir up emotions. But upon further investigation, they don't always hold up. As you say, love is such a personal experience, that bringing in the player effectively and for the long term can be a difficult task, no matter how eager we are to love. Yes! Both Scott and I were big fans of the new PoP. The scene which requires the Prince to jump off the ledge without Elika was icing on the cake for emotional connection through dependence and trust. Ico definitely does the same, which is why I enjoyed writing about frailty in the game a long time ago for a sensationalist post. Also, I have played both Silent Hill games. Shattered Memories in particular I thought pulled off its twist remarkably well. Suddenly things that were not imbued with affection became saturated with love and longing. Familial relationships are different than romantic relationships, but still completely fascinating. You all are making me blush. Thanks for all the warm wishes. Our wedding was surprisingly game-free, unlike some other folks.